Max Townshend has been an interesting and highly creative force on the British and International audio scene for the past 43 years, making huge contributions in many areas. Examples include The Rock turntable with its floating stabilising paddle, supertweeters, and the Allegri preamp — the closest thing to a straight wire with gain. For the last 30 years, however, Townshend has increasingly focused on the role of vibration in audio, designing a family of Seismic Isolation products, to dampen unwanted isolation from the hi-fi system. While a relatively modest operation, Townshend is a mighty David to the industry’s Goliath! Cable manufacturers tend to divide up into two sorts. There are those who listen to a vast number of cables, make their selection and market existing cables dressed up in artful sleeves. Then there are those who approach cable design from the ground upwards, using first principles and innovation. Townshend falls into category number two. If I may be permitted to expound some of the thinking behind the design of the cables; the amplifier has effectively zero output impedance and the speaker load is mainly resistive with a nominal 8 ohm speaker having about 6.5 ohms resistance and the remainder reactive, comprising inductance and capacitance. Any speaker cable also has inductance, capacitance, as well as a small resistance. The value of inductance and capacitance is determined by the geometry of the cable, so the wider the spacing, the higher the inductance and the lower the capacitance and vice-versa. The optimum relationship between inductance and capacitance, as determined by computer modelling, for lowest distortion caused by reflections in the cable, is derived mathematically by making the ratio of inducance divided by capacitance equal to the resistance impedance of the speaker squared. To achieve this correct ratio the cable must have a relatively high capacitance and low inductance. Townshend’s Isolda cable has used this design since 1980 to great acclaim using DCT treatment. (Townshend was the first UK adopter of this technology.) The new refinement is to use Fractal wire instead of DCT, a secret process that Townshend has developed. 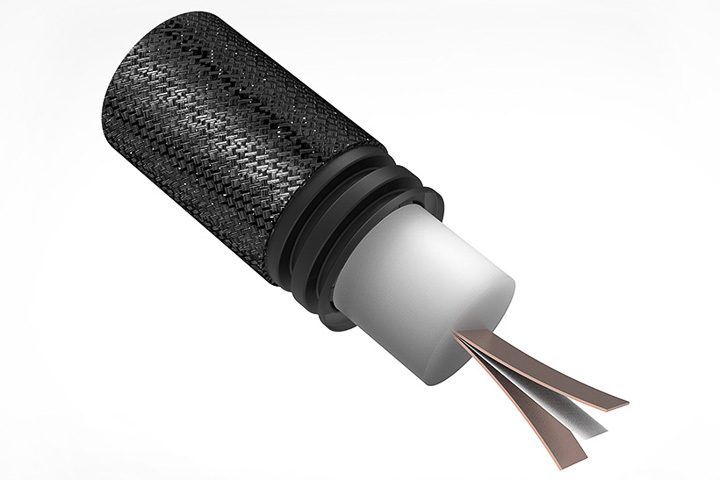 The two closely spaced, Fractally-treated pure copper strip conductors, which are now insulated with ultra thin PTFE, are encased in synthetic rubber and clamped within a strong, flexible conduit trimmed with woven polyester braid. The ends of the cable are terminated in a metal enclosure containing an RLC network to prevent unstable amplifiers from oscillating, to reduce distortion and to act as an RF filter; i.e., acting as an antenna. The cables, while flexible, look substantial.